With a growing family and a family home which in today’s standards is way too small, finding storage options for small homes has become our everyday challenge. My wife and I have become experts in making the most of every square foot we have in the home to ensure we can fit it all in. This week’s post has a focus on clever storage ideas for small houses like ours and most likely yours. Sounds reasonable but in reality it isn’t always practical. Somethings just can’t be thrown out nor sold. So we need to be a little creative and research options which are sensible storage options for small homes. Under bed storage is a really effective way to store clothes, blankets, toys and other key items. Particularly those that you need to access regularly enough but don’t want to see every day. Some beds come with built in drawers, others offer it as an accessory usually on wheels so that you can roll them out easily. Having the design or the colour of the drawer match the bed is usually a good idea. However if you don’t want what the bed offers or anything on wheels for that matter, then consider baskets or other forms of containers. There are lots of options that are shallow enough to fit but easy enough to grab and pull out from under the bed. We have used baskets and several forms of containers for years. It has been a great way to collect and hide books and toys. Today as the kids are a little order, it holds some clothing, blankets and bulkier items like roller skates and blades. Towels that are used during the week, whether it be for hand drying or for showering can be hung behind your bathroom or laundry door. Instead of taking up precious wall space this space behind your doors should not be wasted. There are plenty of hooks that can be used for this and with a door stop, you wont have the hooks hit and damage your wall. The space on your wall that was going to be used to hang your towels can now be used for shelving or something else. If used for shelving, you can store soaps or towels or just display items that pretty the place up. Remember, this article is about storage options for small homes so we need to make the most of every inch we have. This particularly important for heavy use rooms such as the bathroom. Shelving options are plentiful at stores such as Ikea and they come in all sorts of styles and budgets. A great shelving idea that is not used enough is adding storage above your door. Its vertical, it has the width of the door and it is never used. You might want to consider storing soaps or even some of your better towels there. The one challenge with this area of the room is dust. Ideally you want to prevent your towels from collecting dust and not being usablev. It’s a similar space to that above your kitchen cabinets. Never used but a great dust collector. You might want to consider maybe keeping the towels in a nice container which looks well presented and then can hold your nicer towels. This way the container collects the dust should you be a little lax in dusting up there. Managing your collection of spices can be challenging. Like most families you will likely have a collection of glass and plastic bottles or varying sizes. You will also have plastic packets (refills) or varying sizes. Finding one place to hold them all which doesn’t take away from other storage is challenging. I have however found a few ideas for those with smaller kitchens. 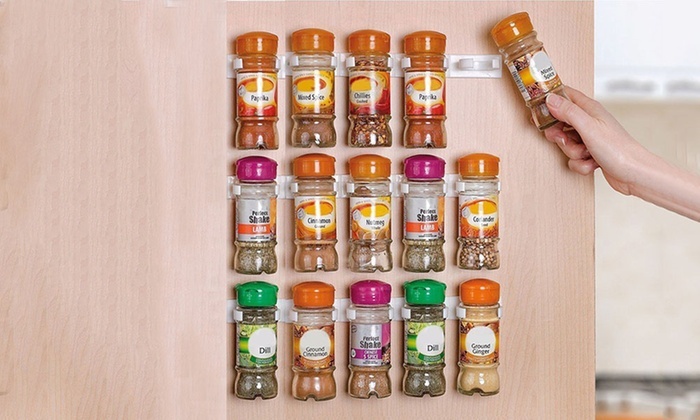 The Sticky Clip in Spice Racks can be added to the back of any cupboard door or even your splash-back (although there might be nicer options if you are going to display them).They are simply stuck on and then your spice bottles are clipped in and stay in place ready to be used. The one challenge is that the size of bottle they hold is fixed or limited, but the idea is certainly worth exploring. Another option is a 4 tier spice rack which actually fits into the cupboard itself. Now, the disclaimer behind this idea is that you probably need to own the home. This idea is also best implemented when the kitchen is being designed from scratch. That space below your kitchen cabinets is never used and totally wasted. Kick-board drawers are a great and really practical idea. They add heaps of volume to your kitchen. A 10mm or so drawer around most of the perimeter of your kitchen can’t be underestimated. Whilst the drawers will not be big in depth they can be as wide as the cabinet itself. A great idea for storing towels and even platters plus anything else that you want hide away. My wife started to use these hooks for towels and whilst I admit I didn’t love the idea at first they are very useful. Instead of just holding towels, you can also hold baskets and other items. Best of all there is no need for additional hardware. There is a great range of hooks on the market and they allow you to hang anything from towels to clothing and baskets. It is really simple to use as well. Just place the hooks over door and hang the basket on the inside or outside of the door. The basket can be used for waste in the bathroom or laundry or as extra storage in the kitchen. Take a quick look around your home and you will notice that you have corners that aren’t put to best use. Why not consider installing floating shelves to create extra storage space. Depending on the style of shelving, you could create a really visually appealing spot for books, vases and photographs.